We stopped hearing from Kestrel on 13 Nov 2017 and, after a month, we had giving up hope and thought for sure she may have gone down. However, on the morning of 9 December, she reported again. One possibility is that she righted herself in heavy seas. We shall see. Along with her sister ship Maurick, she has made many friends along the coast of Florida but is now, hopefully, on her way across the ocean! With the help of Jane Stevens from The Discovery School in Jacksonville Beach, Florida, the US Navy agreed to help get our miniboats back to sea. Leaving Jacksonville Beach aboard the USS Shamal on Nov. 1, Kestrel and Maurick 1 were released off of the coast of The Carolinas. 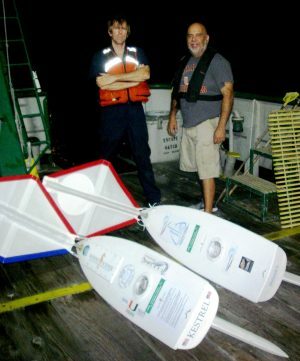 The Kestrel was redeployed with some help from a Daytona Public School on October 10th. 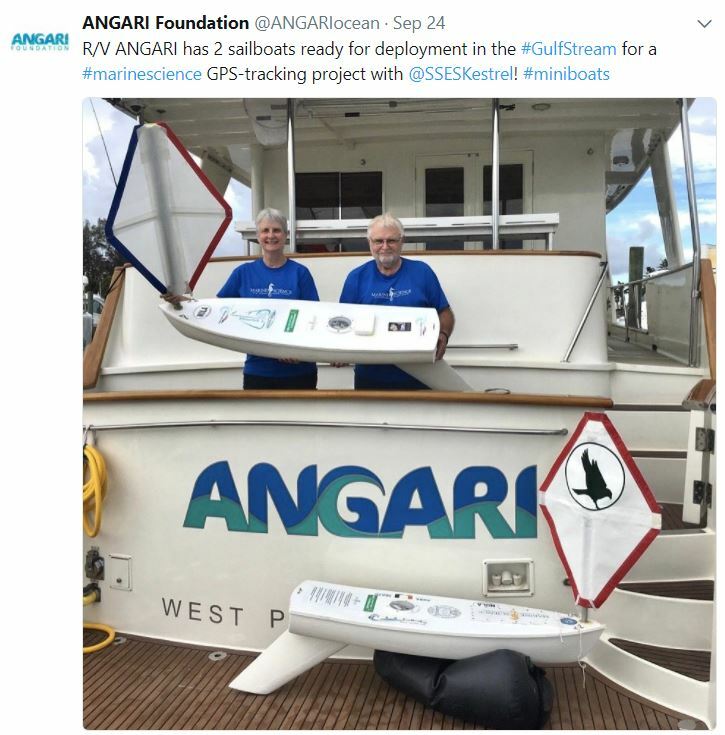 On the morning of Oct 12th, only a few days into its sail, when it appeared to be headed to Jacksonville, we contacted our colleagues at Jacksonville University Marine Science and the SeaGrant Office at UF. 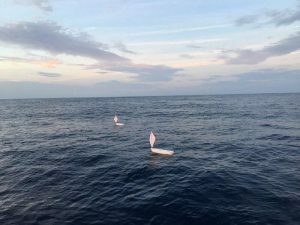 Later the same day, with help from Maia McQuire at UF, we heard the “The Discovery School” had recovered her and they are all making plans for yet another deployment. Kestrel was re-launched (her second voyage) off of the east coast of Florida near Fort Lauderdale on September 26, 2017. Kestrel followed the Gulf Stream north but met up with strong easterly winds that blew her back to shore in Daytona Beach. Lifeguards there followed the directions on the miniboat and took her to a school. Kestrel is spending some time with Ms. Gaines students at Seabreeze High School. Kestrel will be relaunched in the Atlantic at the end of October 2017. Kestrel and the rest of Florida are waiting for Hurricane Irma to pass the area. She is planned for re-launch later this month (this will be her second voyage). On the morning of 3 June 2017, the Kestrel made landfall in a remote area on the eastern portion of the Louisiana delta and eventually showed up at a dock in St Bernards Parish. Several emails and phone calls were exchanged in weeks that followed with various contacts. Anne’s lawyer friends, for example, got interested in the hunt and sent her a nice letter describing their investigation. Turtle researchers from University of Central Florida got involved since they had a satellite-tracked bucket drifter taken out of the water and transported to another area of the delta. Found by a fisherman, she was taken to a dock from which she was recovered on June 16, 2017. Robert Murphy, of the law firm Murphy, Rogers, Sloss, Gambel and Tompkins, and his staff, Sam Buckley and Becky Boudreaux, were key to finding and recovering Kestrel. 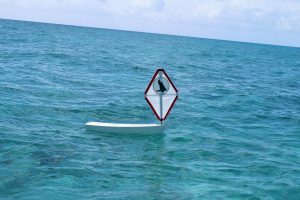 The Kestrel​ was launched on May 14, 2017, near Biscayne National Park in Homestead, Florida with the assistance of the research vessel RV Walton Smith and the CARTHE team at RSMAS. We are hoping that our Mini Boat will allow our school to collaborate with United States and international schools and governments who find our boat. We want to Skype with the parties who find our boat, engaging other students in the adventure of the Kestrel and its journey. 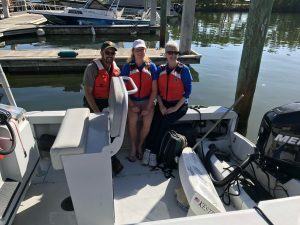 Biscayne National Park Ranger Gary Bremen, Caitlin Lynch and Ann Marie Shields with Kestrel on Biscayne National Park’s boat ready for our shakedown cruise. 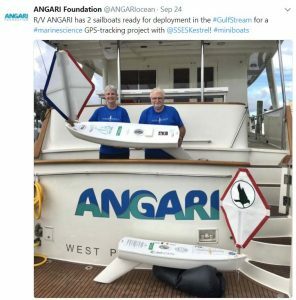 We are hoping that our MiniBoat will allow our school to collaborate with United States and international schools and governments who find our boat. We want to Skype with the parties who find our boat, engaging other students in the adventure of the Kestrel​ and its journey. Our MiniBoat project is focused on collaborations. Working with Ranger Gary Bremen at Biscayne National Park and Laura Bracken, CARTHE Outreach Coordinator for the University of Miami Rosenstiel School of Atmospheric and Marine Science (RSMAS), As part of the 100th anniversary of the National Park Service, Biscayne National Park provided guidance and RSMAS helped determine the best launch location for the Kestrel. 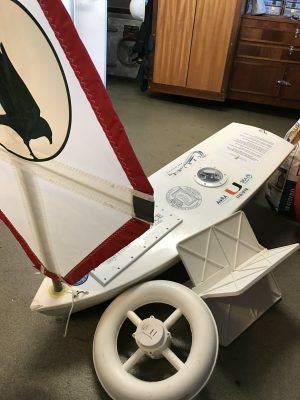 Launching the Kestrel​ ​ is also an international collaboration between Saint Stephen’s Episcopal School marine science student Caitlin Lynch and two students from Maurick College in The Netherlands. Amber Smeulders and Sabine van den Boer communicated with Caitlin via email and Skype in anticipation of their own visit to the U.S. Amber and Sabine will visit Florida in April of 2017 when they will launch a MiniBoat of their own using the launch plan of Saint Stephen’s as a model. Saint Stephen’s faculty advisor Ann Marie Shields and Maurick College faculty advisor Ad Browers help with logistics and transportation. Saint Stephen’s Episcopal School is a college preparatory school located in Bradenton, Florida. All students at the school, grades Pre-K3 through 12, participate in a strong marine science curriculum. The project at Saint Stephen’s is led by Ann Marie Shields, the Science department chair, and grade 11 student Caitlin Lynch. Kestrel ​got its name after a school-wide invitation to submit names was held. Kestrel was chosen because it is a very small species of falcon — our Saint Stephen’s school mascot. We now have a mini falcon name for our MiniBoat. We invite contact with other schools and student groups who are interested in our MiniBoat project. We can be contacted at ashields@saintstephens.org. Our school website is www.saintstephens.org. On Twitter @SSESKestrel. We invite contact with other schools and student groups who are interested in our MiniBoat project. We can be contacted by email.